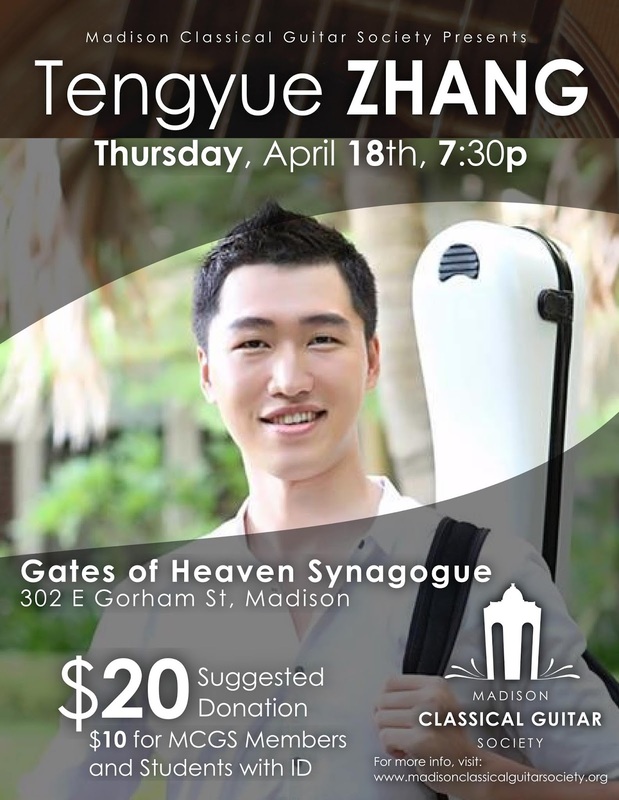 MCGS welcomes Tengyue (TY) Zhang for a solo concert at Gates of Heaven on April 18th. Please follow us on Facebook for more details! Four Guitarists - One Great Concert! 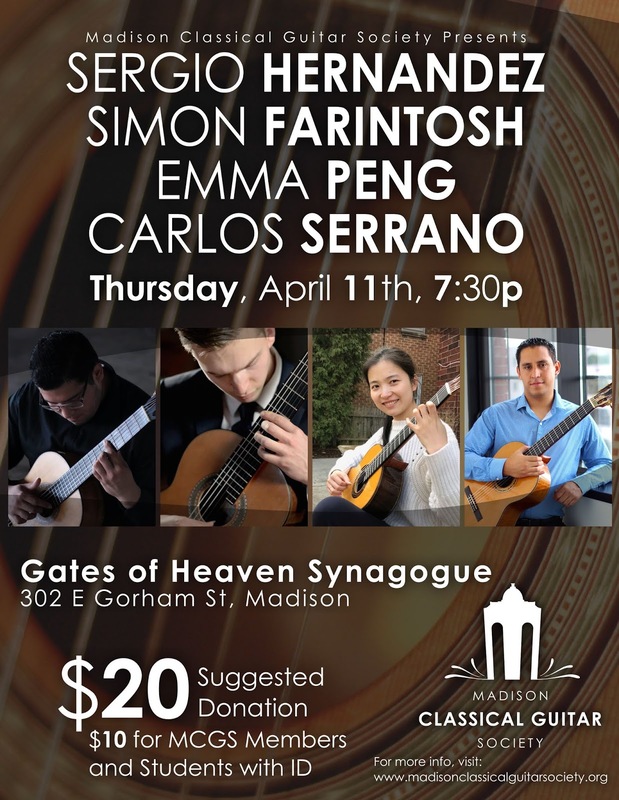 MCGS welcomes four talented guitarists to Madison on April 11th for a diverse program of solo works. Sergio Hernandez began to show musical aptitudes at age 15 when he had join an estudiantina class in Hanna High School under the direction of Raul Molano. In 2011, in the search for a more refined craft, Sergio began private guitar studies with Dr. Jonathan Dotson. That same year, Sergio participated in the UTPA Solo Guitar Competition where he received first place in the high school division. Sergio received his Undergraduate Degree in Music Education from the University of Texas at Rio Grande Valley under the tutelage of Dr. Michael Quantz and Dr. Jonathan Dotson. While there he was a member of the One O’clock Guitar Ensemble and achieved notable performances with this group. During his four years with the One O’clock ensemble Sergio performed at a national and international level including the Schönbrunn Palace and the U.S Embassy Amerika Haus in Vienna, Austria. In 2015, Sergio was invited to participate in the International Classical Guitar Workshop in Carrion de Los Condes in Palencia, Spain where he had the opportunity to work with virtuoso Rene Izquierdo. In there, Sergio was able to perform for new audiences and give concerts for the pilgrims on their way to Santiago de Compostela. Sergio is currently studying Masters in Classical Guitar Performance degree in the University of Wisconsin-Milwaukee under the tutelage of virtuoso Rene Izquierdo. Sergio is a recipient of the Chancellor’s award scholarship and the Agah Classical Guitar Endowment. Simon Farintosh is a promising young guitarist from the west coast of Canada. He earned his Bachelor of Music Degree at The University of Victoria where he was a student of Dr. Alexander Dunn, and is currently a graduate student and teaching assistant at The University of Wisconsin-Milwaukee, where he studies with Rene Izquierdo. Simon has won top prizes at several competitions, including 1st Place at the 2018 Northwest Guitar Festival, and is a three-time recipient of the British Columbia Arts Council Award. He plays a 2015 Glenn Canin guitar. 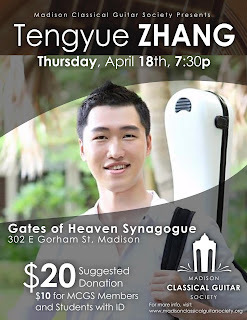 Bo Peng, a native from China, has recently graduated from University of Wisconsin - Milwaukee with a Master in Music. She was trained and practicing in classical guitar since a very young age. She was a classical guitar prodigy with great potential and was awarded several times in local and national competitions. After high school, she chose to pursue a degree in economics and later acquired a master degree from the Southeast University. The logical training during her study in economics has reflected to her guitar performance, especially her interpretation of the complexity of masterpieces composed by J. S. Bach. With her passion for the classical guitar, she became a professional soloist after leaving her economist job. She started to study with Professor Rene Izquierdo since 2015. During years of dedication to her performance, she studied from guitarists and professors including Qing He, Kenneth Kwan and Jiajiong Li and master classes with maestros including Paul O’Dette, Ronn McFarlane, Łukasz Kuropaczewski, Álvaro Pierri, Jérémy Jouve, Raphaella Smits, Sharon Isbin, Timo Korhones, Judicael Perroy, Giampaolo Bandini, and Shin-Ichi Fukuda. Ms. Peng has shared stage with Prof. Rene Izquierdo and Prof. Elina Chekan as a guitar trio. She is currently an active performer as a soloist. Her solo repertoire includes works from J. S. Bach, Domenico Scarlatti, Fernando Sor, Enrique Granados, Isaac Albéniz and Leo Brouwer. 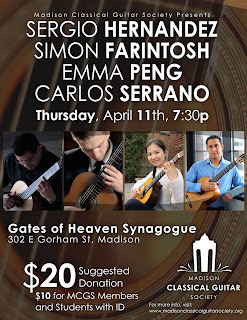 Born in Bogota, Colombia, Carlos Serrano has completed a masters degree in Classical Guitar at the University of Wisconsin-Milwaukee. During his undergraduate degree, Carlos became aprize winner of the 19th Annual FIU Concerto Competition. He completed a Bachelors Degree in Classical Guitar Performance from Florida International University. His commitment to the guitar and talent have enabled him to perform in master classes given by guitar virtuosos such as Shin-Ichi Fukuda, Aniello Desiderio, Ricardo Gallen, David Russell, Pepe Romero, Manuel Barrueco, Dimitri Illarionov, Adam Holzman, Andrew York, Xuefei Yang and Baroque music specialist Anthony Newman. Carlos Serrano has performed in several events presented by organizations such as The Miami Classical Guitar Society, Marcus Theaters, Perla de Esperanza Foundation and Florida Guitar Foundation. Besides these events, Carlos has performed with the Milwaukee Mandolin Orchestra FIU Miami Guitar Orchestra, FIU Jazz Guitar Ensemble and the FGF Guitar Ensemble. Carlos Serrano has studied with virtuoso Rene Izquierdo, Federico Bonacossa, Rafael Padron and guitarist/composer Mesut Ozgen. 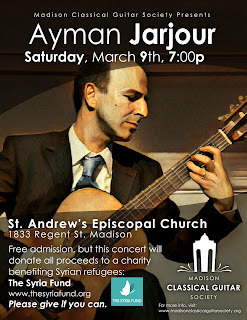 Ayman Jarjour is hosting an open-admission concert on March 9th to benefit Syrian refugees. Admission is free, bur all donations/proceeds will be donated to The Syria Fund, at the request of the performer. 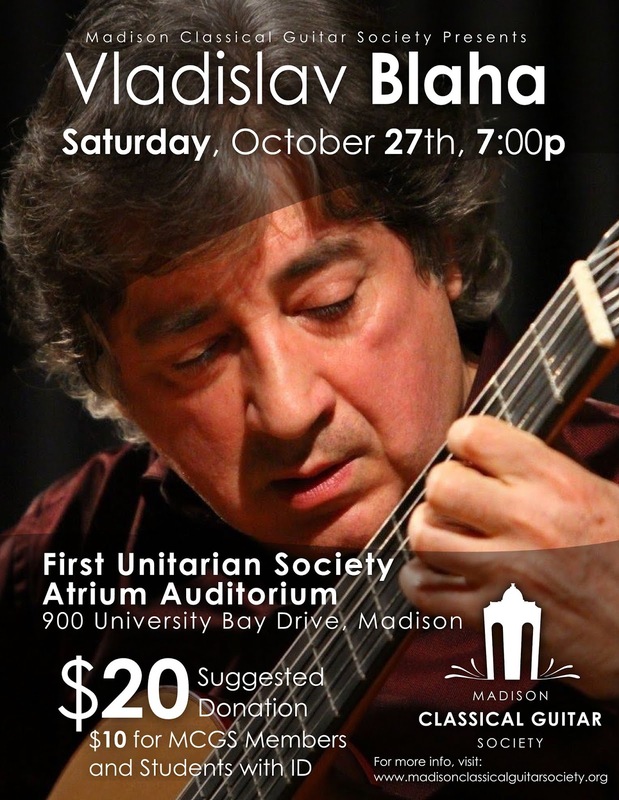 Please come to see an amazing international guitarist, and please give if you're able. 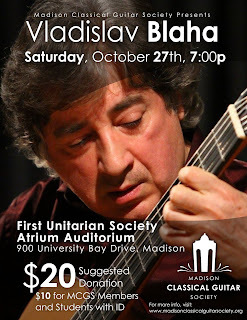 MCGS is extremely pleased to host Czech guitarist Vladislav Blaha at the First Unitarian Society in the magnificent Atrium Auditorium. Mr. Blaha has performed in some of the most prestigious halls in over 45 countries, including Carnegie Hall. There is an active and vibrant culture of new music for the guitar coming out of the Czech Republic in recent decades, and Vladislav's program will feature some of this exhibiting some extended techniques that you don't often see or hear. Mix this in with some classic favorites, and you have a night to remember and inspire. More information on Mr. Blaha can be found on his website, as well as videos, articles, and reviews. Please give it a look and mark your calendars for the 27th! Steve and Sridhar as Duo Tárrega will be performing concert of repertoire for guitar and flute. 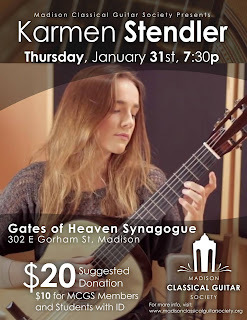 Please come support these local favorites and enjoy a night of beautiful pieces in the intimate setting of the Gates of Heaven in James Madison Park. Please give what you can as all proceeds will go to the artists. We're excited to host FOUR very talented guitarists for a concert on Sunday, August 19th at Lakeside Street Coffee House. In years past, we've had the good fortune of catching some fierce players coming to the Midwest for the prestigious Wilson Center Guitar Competition and this year is certainly no exception. Dan Kyzer, Noe Garcia, Evan Taucher, and Jesus Serrano will be fresh from that competition and will be bringing their most demanding and perfectly honed material. Dan Kyzer brings soulful emotion and unique insight to the classical guitar and its repertoire. As a soloist, Dan prides himself on giving audiences across the US an experience that is both introspective and uplifting. His roots are in the bluegrass and blues music he played as a teen in Jackson, MS, but upon discovering the classical guitar as a high school senior, Dan immediately began studying under Dr. John Ingwerson at Hinds Community College. After finishing his undergraduate work at the University of Southern Mississippi with Dr. Nicholas Ciraldo, Dan earned a scholarship to the New England Conservatory in Boston, MA where he studied with the world-renowned guitarist Eliot Fisk. While in Boston, Dan maintained a studio at the Boston School of Guitar and performed with groups like the Boston Metro Opera and MIT Women’s Chorus. Dan also played concerts at the Boston Public Library, Allston-Brighton UMC, Wood’s Hole Library and Williams Hall at NEC. He interned with the Boston GuitarFest and worked with Guitar and Friends, a non-profit guitar organization. After earning a Master of Music with Academic Honors from NEC, Dan moved to Denton, TX to begin doctoral studies at the University of North Texas under the tutelage of Mr. Thomas Johnson where he earned a Doctoral Teaching Fellowship. An important contributor to the Dallas-Ft. Worth classical guitar scene, Dan is an adjunct professor at both Mountain View College and North Central Texas College, and serves as the Director of the Mountain View College Guitar Festival, now in its fourth year. He regularly performs outreach concerts and community performances as the Social Media Director for the Fort Worth Classic Guitar Society. His chamber music collaborations include Fort Worth Opera, Orpheus Chamber Singers, UNT University Singers, and Music Theater Denton. Dan also holds prizes from several national guitar competitions including first prizes from the New Orleans International Guitar Festival, Southern Guitar Festival, and Mississippi Guitar Festival, and second prize from the Sierra Nevada Guitar Festival. Most recently, Dan completed a solo concert tour through the Midwest and Southeast in February 2018, including concerts at Oklahoma City University, Louisiana Tech, and the University of Southern Mississippi, and appearances on the Allegro Guitar Series in Dallas and Fort Worth, TX. Dan plays a 2014 Aaron Ringo double-top guitar made in Weatherford, TX. Classical guitarist Noe Garcia Jacinto received his Music Education degree from the University of Texas at Brownsville under the direction of Dr. Michael Quantz and Dr. Jonathan Dotson. In 2015, he completed his Masters in Performance from Columbus State University where he studied with internationally recognized guitarist Dr. Andrew Zohn. He has performed in master classes for world-renowned artists such as Manuel Barrueco, Los Angeles Guitar Quartet, Pepe Romero, Beijing Duo, Zoran Dukić, Adam Holzman, Goran Krivokapić, Gabriel Bianco, Marcin Dylla, and Duo Melis. Noe is a top prizewinner in competitions including the 2018 New Orleans International Festival & Competition in New Orleans, Louisiana; 2017 Florida Guitar Festival & Competition in Tallahassee, Florida; 2016 Appalachian State Guitar Festival & Competition in Boone, North Carolina; 2016 Wilson Center Guitar Festival & Competition in Brookfield, Wisconsin; 2016 University of Louisville Guitar Festival and Competition in Louisville, Kentucky and the 2015 Southern Guitar Festival and Competition in Columbia, South Carolina. In 2017 he was a semi-finalist in the prestigious Schadt String Competition for Classical Guitar. In the summer of 2016, Noe traveled to Carrion de los Condes (Palencia), Spain to perform as part of the Camino Artes concert series. Most recently, Noe traveled to China for the second time and performed a series of concerts in Qinhuangdao, Jinan, Dalian, Suzhou and Beijing with Trio Resonance. He is currently working on doctoral studies at the University of North Texas where he was awarded a teaching fellowship. 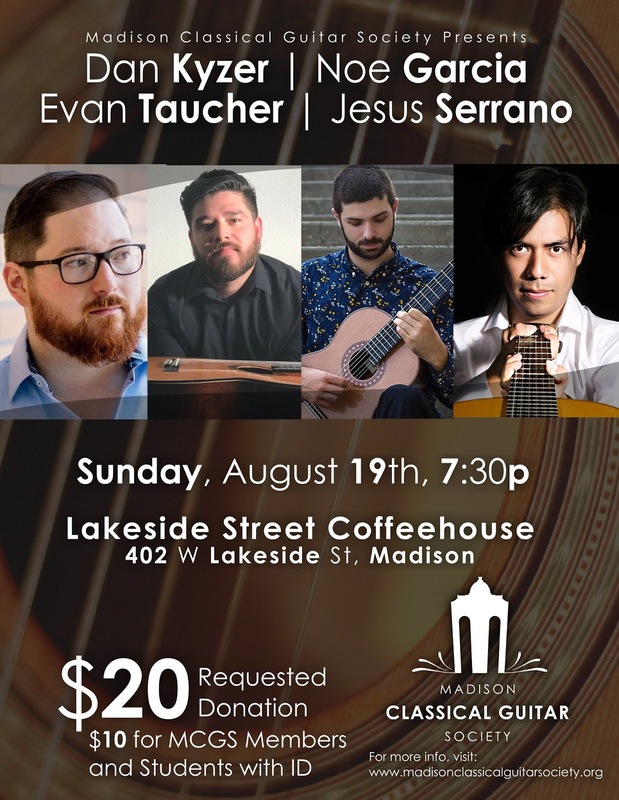 American classical guitarist, Evan Taucher was born in 1992 and began classical guitar studies at age 19. Since then, he has won numerous prizes in national and international competitions. 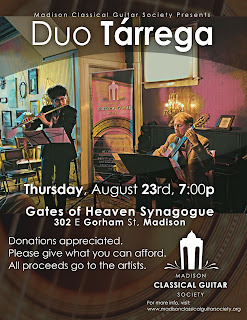 Taucher holds a Bachelor of Music from Florida State University where he studied with the world renown pedagogue Bruce Holzman, and recently completed a Master’s degree at the University of Wisconsin Milwaukee where he studied with the Cuban Virtuoso Rene Izquierdo. During his studies, Taucher had classes with musical luminaries such as John Williams, Alvaro Pierri, Sergio and Odair Assad, Aniello Desiderio, and Soloduo among others. During his two years of study with Rene Izquierdo, Taucher won 8 separate prizes in professional competitions throughout the United States including 1st prizes in the Schubert Club Competition, Appalachian State Guitar Competition, and the SIYAO instrumental competition where he competed against all instruments and ensembles. In 2017, Taucher was awarded a grant from the U.S. Embassy to compete in the GuitarArt festival in Belgrade, Serbia. In the summers of 2014 and 2015, he performed at Busch Gardens Tampa on both solo classical and electric guitar with the award-winning Burn the Floor dance company. Taucher was also the first guitarist to enter the University of Texas at Austin’s prestigious Artist Diploma program where he currently studies with Adam Holzman. Taucher actively engages with a large social media presence consisting of aspiring classical guitarists where he live-streams technique workshops weekly to those looking to improve their technical abilities. Taucher plays Steven Walter guitars and exclusively uses D’Addario strings. Mexican guitar virtuoso Jesus Serrano concluded his degree with honors at National Conservatory of Music in Mexico City under the guidance of Selvio Carrizosa and Jaime Soria, currently is pursuing a Master Degree in the prestigious class of Carlo Marchione at Conservatorium Maastricht in the Netherlands. A constant touring schedule has lead him to perform concerts in some of the most diverse halls in Holland, Mexico, Canada, the United States & Turkey. His discography includes two albums “Santo Antonio” and “Fantasía Tropical”, both recorded as an active member of 3NS4MBL3 (guitar trio/quartet) and were his debut work as an audio engineer. Has attended masterclasses with Adriano del Sal, Antigoni Goni, David Russell, Eliot Fisk, Leo Brouwer, Marcin Dylla, Marco Tamayo, Paolo Pegoraro, Pepe Romero, Ricardo Gallén, Víctor Pellegrini, William Kanengiser, Xuefei Yang, Zoran Dukic, etc. Jesus has won more than two dozen international guitar competitions all over North America, including the 2015 Boston GuitarFest, the 2016 Florida Guitar Festival and the 2017 Festival et Compétition Internationale de Guitare Classique de Montréal. Jesus Serrano plays on his Signature Model The Aztec Guitar made by Aaron Ringo.